Such an arrangement can fulfill most temperature measurement requirements. The non-contact infrared measurement is ideal for non-reachable situations, due to safety or sanitary reasons—instant readings, safely and reliably. Or use the thermocouple for high precision measurement of contact surfaces, gases, and liquids. 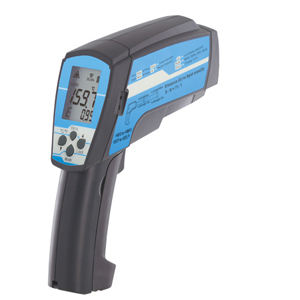 The OS768-LS can also help measure emissivity, which is often difficult for a user to determine. Use the Type K thermocouple contact to measure the true temperature. Then, use the non-contact infrared to get the surface temperature. Adjust the emissivity until they are the same, with the option to use the same emissivity setting for that object next time. No more guess work, no more looking up on Emissivity Table. This unit also comes with an ultra-long battery life (batteries are included). Note: Comes complete with CD, USB cable, 1 Type K thermocouple, 2 “AAA” batteries, magnetic stand and operator’s manual.